Filer and seasoned CFI columnist Trevor Shpeley is bringing readers inside saw filing shops in 2019. For his first profile, he gets to know Eagle Valley Saw Service in Malakwa, B.C. Father and son, Lambert (right) and Aaron Timmers, are the owners of Eagle Valley Saw Service. Photo by Krystyn Kral. For three years I have been using this space to talk about some of the basic techniques of repairing saws, but you can’t really talk about saw filing without talking about the filing rooms where it all happens. In the next year I hope to bring you examples of the hidden heart of the sawmill: the filing room, in all its grungy glory, where to a large extent, a mill’s fortunes are made or lost. Most of the shops we will be looking at are housed in the sawmills, but not all mills are large enough to justify maintaining their own facility so there will always be a need for independent filing rooms that service several mills. Such is the case with Eagle Valley Saw Service in Malakwa, B.C. The business started nearly 50 years ago when a young filer named Lambert Timmers started a small shop serving the needs of local craftsmen. Soon he began to do shingle saws on the side, and caught the attention of a local log buyer who was looking to build a reman plant. The buyer talked Lambert into expanding his shop and purchasing the equipment required to service the larger mill. With that, Eagle Valley Saw Service was off and running. Fast-forward to today and the shop is busier than ever. Eagle Valley employs three full-time filers, but that number can increase as customer demands change. Over 30 sawmills and reman plants currently rely on the services of this busy shop. Customers send their saws in to be straightened, tensioned and sharpened with the exacting precision only years of experience can command. 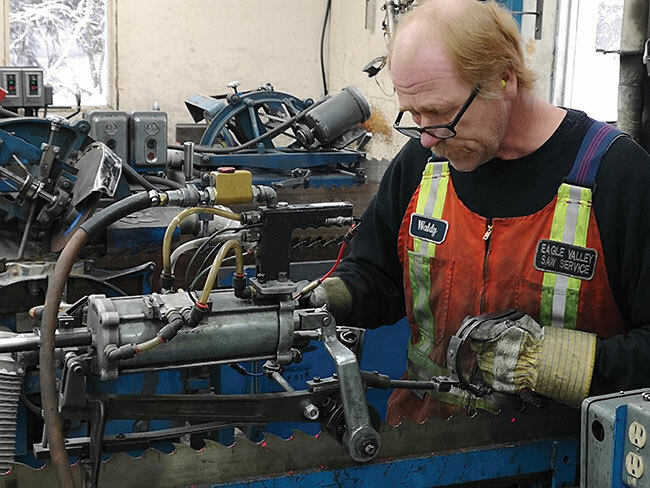 Large bandsaws and roundsaws are their bread and butter, but the shop also handles Wood Miser blades and all the Zamboni knives for ice rinks from Vernon to Golden, B.C. They are even able to deal with 102-inch cuttoff saws, such as those they service for Atco Wood Products in Fruitville, B.C. Servicing used saws is not Eagle Valley’s only business. They also provide new saws for the mills that require them. The shop brings in “punch and weld” bandsaws from the saw manufacturers, which are basically just the saw steel welded in a loop with the teeth punched out. They look like bandsaws but you couldn’t run them in that condition. The crew in the shop swages, benches and tensions the virgin steel in a timeframe and with a level of precision that is difficult for the large manufacturers to match due to constraints of scale. The roundsaws get the same level of attention and are delivered to the customers tuned to the requirements of their mill, ready to run. The company’s latest homemade machine is dubbed the “Frankenswage”. Photo by Krystyn Kral. At this time the 3,200 square feet of the tidy shop is stuffed with well maintained, proven equipment that gets the job done. Wright grinders take center stage with the inventory, but Armstrong also has a strong presence in the shop. Thanks to Lambert’s love for modifying existing machinery to better suit his needs, a few homemade grinders are also regularly used in the shop. 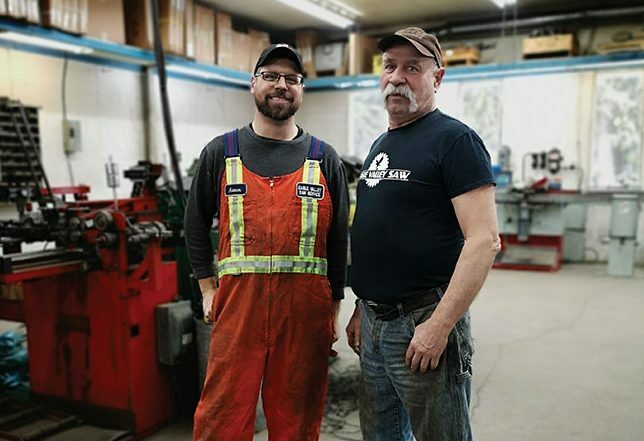 At 69 years young, Lambert is slowly letting loose the reins of the plant to his son Aaron who shares his father’s philosophy in most things and has a love for the trade that shows in the work that they produce together. Lambert will be among the attendees at this year’s B.C. Saw Filers Convention in Kamloops in late April, where we will get to see his new creation dubbed “Frankenswage.” Like most of what Lambert builds, it’s simply a good idea made better. Most of us in the sawfiling trade in B.C. have heard of Eagle Valley Saw. They have been around a long time and are well respected among industry and filers alike. What many people may not know, however, is that many of B.C.’s best filers started out in Lambert’s shop before making their way to their own mills. Eagle Valley has always taken young filer wannabes into the shop, often with little or no experience, and made sure they got enough schooling and training to find employment in the somewhat inbred trades environment of the larger sawmills. We can only hope that more filing rooms will take Eagle Valley’s lead and find ways to bring young people into the trade and turn them out job-ready and eager to take saw filing forward. The rest of us aren’t getting any younger and the trials faced on the traditional path to certification can be daunting. We are looking for other filing rooms that would like to be profiled in this space. If you are interested, please ask your mill management for permission; the mill will always get final approval on the article before printing. I can be reached at trevor.shpeley@gmail.com. The saw filing equipment in Eagle Valley Saw Service’s shop.